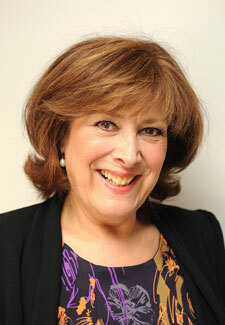 Lynda, 64, lives in North London with her husband Michael – better known as Mr Spain! I’m going up to Bradford to do pantomime so I had my Christmas Day on 25 November. I won’t be around on Christmas Day, but it means I get to put my feet up when the rest of you are all going mad. I open on the 15th of December in Bradford in Cinderella playing the fairy queen and I’m there til February! It’s a long run. Do you enjoy doing panto? I do. It was my first time last year and I thought I’d have another go while I can still move! I never normally miss Christmas – it’s a big thing in our house – so last year was a bit strange and then I hopefully shan’t do it again. I just love Christmas. I love the preparation. Christmas Eve is probably the best bit, there’s all the anticipation and excitement building. I try to keep the traditions going and they all get a stocking still, even though my sons are in their twenties now! But it’s hard to fill stockings cheaply as they get bigger because all the small presents seem to be expensive! Gone are the days of the tangerines and the nuts, and the paper money, but I find the odd thing. I haven’t got anything on there. I’m very lucky, I just want everybody to be happy and healthy, but that’s a mum thing. That’s all you worry about, that everybody’s happy and safe. Why did you get involved with Age UK? I think it’s brilliant how the public respond to all the charity campaigns, but I think it’s very hard for the charities to think of things that are inspirational and don’t cost too much money. What I like about this is that everybody’s got a jacket or a coat they don’t wear anymore and it’s so easy to pop it into a shop. I always like to recycle because it gives you an excuse to go and buy something else! I give it to a friend, they look brilliant in it and my guilt is assuaged. Is care of the elderly something that’s close to your heart? Absolutely. My parents were very much of the war generation and were very hardy, but nowadays the second generation after the war, which is my generation – we’ve never had it bad. I remember as a child having no central heating and waking up in the morning with ice on the windows, but most people don’t have any comprehension of that. At least when you’re young, you’re moving about all the time and can put an extra layer of clothing on. But it’s the combination of spreading the warmth with being warm and feeling wanted and having somebody care about you and knowing you’re not on your own. Loneliness is the most awful, underrated thing. And when you’ve lived a life, had children, done all the things we’ve all done, and feel like there’s nobody out there, it’s grim. My mother had Alzheimer’s and I’m an ambassador for them. I’ve got lots of friends and we’re all defined by our work, but if you take that away, which is what happens as you get older, it’s quite difficult to know where you stand in your community. And one of the ways to get over that is to nip across the road and see somebody, donate a coat. It’s a tiny thing, but you connect with another human being and forget about yourself for a minute, and you just feel good about yourself. You’ve helped another person and feel good about yourself. Is charity important to you then? We can’t survive without it in this day and age. If Brits weren’t so kind and generous, the government would have to step in and do more and they’d be very hard pushed. But on the other hand, charity does begin at home. I feel strongly at the moment that the global recession makes people nervous and feel we have no control. But you do, in your homes, among your friends, and if you keep it local, you really can make a difference. Instead of worrying about the rest of the world, let’s worry about next door. From small things, big things grow. Have you been watching Strictly? Yes and I’m absolutely voting for Lisa! She’s bloody brilliant. I’m not surprised though, of course, because I did Calendar Girls with her. I knew the talent that was lurking there. She’s so lovely and she so deserves to win. Have you kept the dancing up yourself? No, not at all. I’ve got a ball coming up and I noticed at balls after Strictly that I’d have men coming up to me and asking for a dance, but they only ever wanted to show off. They weren’t interested in me, I could have been anybody! But I’ll see if that happens again. I’ve got a novel coming up in March. I was commissioned to write two novels off the back of my autobiography. It’s a saga that starts in the 1800s and is all about mothers and daughters and follows a family through 100 years. I’d love to earn a living from it, but I still have a foot in both camps at the moment. I’m still acting, I’ve got My Tasty Travels and there’s talk of another series of that. I enjoyed doing it, but it was really hard work. I enjoyed the cooking and I’m hoping there’ll be another series because I’ve got a great idea for a cookery book, which I won’t tell you about in case someone steals it! I love keeping busy. I just love to work and it keeps me young. Plus, as a freelancer, you can’t say no or you’ll be punished!